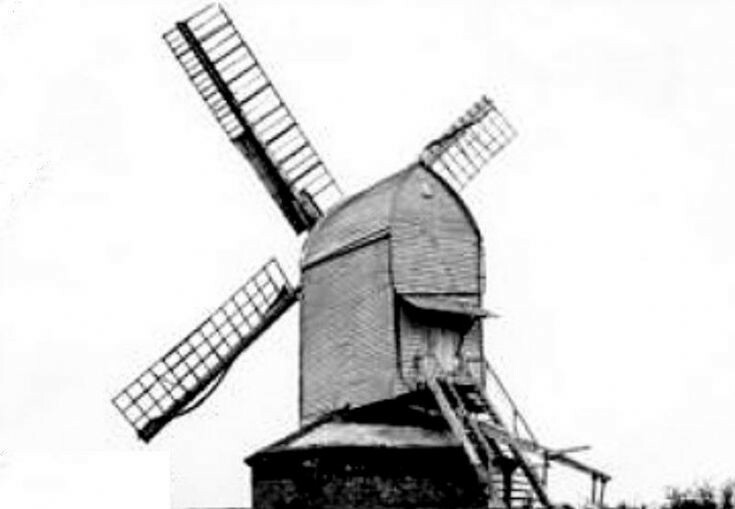 The picture is not of the Handcross windmill, but another example of what it could have looked like. The Large Version shows a copy of the Tithe Map of 1842 which marks the location of the “Windmill and Plat” as plot 308. The building at the top of the map is the old toll house, which, with Chodds Farmhouse also located on the east side of the road, was not numbered as it was in Cuckfield Rural parish at that time. Henry Knowles occupied the Fountain Inn (300), Mill Plat and yard (302), and Road Field (301). The cottage next to the road (309) and Builders Yard (310) was occupied by Joseph Biggs. The cottage has since been replaced by Archpool, built 1894. The four terraced cottages (311), described as tenements and gardens, were Batchelors Buildings, built 1809 (see picture #416). Select Open Document to view another document supplied by Brenda relating to the history of Handcross Windmill. I would be interested to see the map showing Chodds as it looks like a building fronting the road which might coincide with the change in the direction of the hedgerow. It is set back with the trees in front and then as you move towards Chodds Cottages it sticks out and borders the pavement. Was there was once a building where that piece of hedge is? Sam, I have copied a very small part of the Tithe Map of the former Cuckfield Rural Parish. This was produced in 1843, one year later than the Slaugham map. The Cuckfield map is in a very poor condition and badly stained in the top left-hand corner, being the part which borders Handcross High Street! I have added the fragment to the website and it can be viewed by selecting Open Document and scrolling to the second page. At the bottom of the High Street can be seen the fork with the road to Horsham on the left, and Cuckfield and Brighton to the right. There are just two houses shown and tinted red, being the old Dame’s School marked Windhill, and Chodds just to the north. See picture #100 for a photograph of the potential view up the High Street. Chodds is numbered 1477 and described simply as “Buildings, Yards, Gardens etc”. However, as you suspected, it does show a small building on the roadside in front of the farmhouse and would certainly account for the kink in the hedge line. Could that be the edge of the building on the left in picture #410? A job for Time Team, methinks! Further to the above comments, I attach a part of a map from the OS 1842-1952 collection at the National Library of Scotland. It shows a small building where the hedgerow steps back. Thank you Peter, that is very clear. Interestingly, the garden of Chodds looks as if it is divided and the small building has a portion of it. I also notice that the threshing barn is drawn on the map but there were two other farm buildings in the driveway. Barry, I know the building on the left in the photo is the old dairy part of the house which is attached to the main building. Time Team would be great. Mum and Dad dug up many interesting artefacts over the years and even found items in the house including old baby boots up the chimney and a small wooden pot with little black tablets wrapped in parchment that was hidden in the wattle and daub above the fireplace. They are likely to be herbal tablets placed there to ward off evil spirits. Sam, the ridge line on the building on the extreme left of picture #410 is about two feet higher than the gutter of the main building. However, all other pictures of the farmhouse on the website and Street View show the ridge line of the old dairy lower than the gutter. Also the gable end, if that is what we can see, is detached from the house, with a view of trees between. It is also difficult to determine if the building is on the roadside or level with the farmhouse. We may have to wait for another photograph to turn up with a better view! I’m not convinced yet, Barry! I think that it is the chimney pot that looks like a gable end. That would mean that the ridge tile is inline with the main gutter. Pictures 399 and 400 show the chimney pot more clearly. Also, the place where the hedge juts out is much further to the left and closer to the road. I love a bit of controversy!! Sam, I have looked at the alleged chimney pot and am fairly convinced that in fact is has the appearance of being a chimney pot! The triangular shape I saw was caused by a shadow bisecting a cylindrical object. I must swap up on my geometry! I have looked at all the Victorian photographs of the High Street hoping for a glimpse of the roadside building, but without success. The photographs of the time concentrated on the western side on the road where most of the buildings were. Well done! I shall keep searching for a picture of the mystery building.